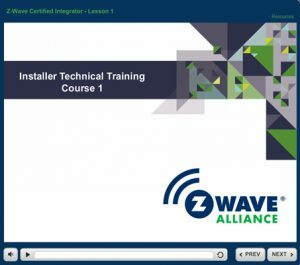 The Z-Wave Certified Installer Training provides installers with tools, best practices, protocols and rules for successful Z-Wave installations, and is now easily accessible on the Z-Wave Alliance site. Completion of the training, which spans two interactive 90 minute tested-courses, will earn installers CEDIA CEU credits. Electricians and security professionals can apply for CEUs in their specific state. The first session covers the fundamental concepts, foundation and architecture of Z-Wave as well as how-to guides on adding nodes, configuring the mesh network and working with routers. 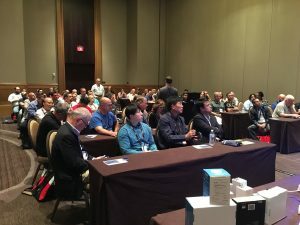 The second session takes a deeper dive into interoperability, building materials, signal attenuation and other installer-specific issues surrounding designing and implementing a Z-Wave network in a real-life smart home. Take the course at your own pace. There’s no need to finish the entire course all at one time; the courses may be started and stopped at any time; sessions will continue where previously left off. Integration companies that join the Z-Wave Alliance will receive access to the Z-Wave Certified Installer Training for their entire staff. Certified installers may display the “Z-Wave Certified Installer” badge in their marketing materials, on websites and vehicles. Certificates of completion may be downloaded immediately after passing the course; suitable for framing! Watch this space for more training modules and content! Z-Wave training at CEDIA 2015! Join us at live events as we deliver valuable, engaging content in an interactive format. The Alliance website has a forum where integrators may discuss things, ask questions, get help from others, post ideas and experiences.